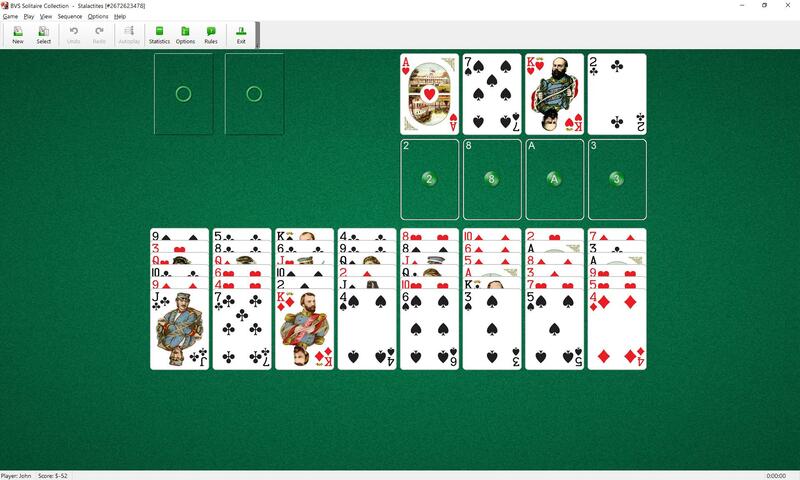 Stalactites Solitaire uses 52 cards (1 deck). 4 cards (top) are the start row. There is space for 4 foundations below the start row. The rest of the deck is dealt into 8 tableau piles below foundations. Each pile contains 6 cards. Two cells are placed to the left of the start row. To build the foundations up, regardless of suits, finishing each foundation with a card from the start row. 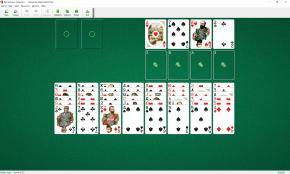 Cards of rank one point lower than corresponding cards from start row are moved from tableau piles to the foundations. You should build foundations up regardless of suit. Only the top card of each tableau pile is available for play on the foundations or cells. Each cell may contain only one card. Cards in the cells can be moved to the foundation piles only. You cannot move cards from one tableau pile to another one.